For almost a century, Nassau has enjoyed an economy based primarily on tourism. Few destinations anywhere in the world can rival the reputation the city holds as an established brand for hospitality and beauty. However, the country also boasts rich cultural traditions in the craft of straw work and the folk art festival of junkanoo, both of which are firmly grounded in Bahamian history and heritage, upon which Creative Nassau is concentrating its efforts. Creative Nassau's objective is to expose and promote these indigenous crafts and folk arts by enhancing awareness, appreciation and celebration of Bahamian art, culture and heritage. Having obtained the official designation for Nassau as a Creative City of Crafts and Folk Arts on December 1, 2014 from the UNESCO Creative Cities Network, Creative Nassau continues in its quest to develop a Creative Tourism model to stimulate these areas. Members of Creative Nassau, along with Executive Members of the Downtown Nassau Partnership officially unveiled the UNESCO Creative Cities Network Banner at the Creative Nassau Pompey Square Market in March 2015. 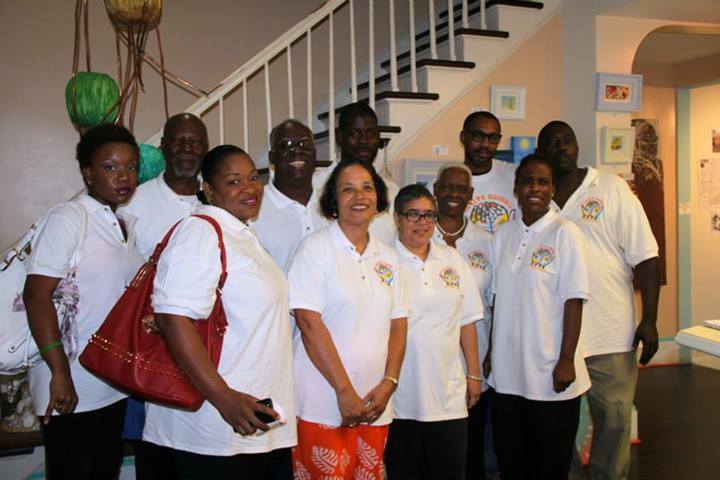 Left to right: Pam Burnside CN President, Dr Davidson Hepburn, CN Secretary, Vernice Walkine DNP, Patricia Glinton Meicholas, CN Vice President, Rosemary Hanna, Charles Klonaris and "Mayor" Gevon Moss of the DNP. On Friday, May 16, 2014 Creative Nassau held their Official Launch and website 'Go Live' event at Doongalik Studios in Nassau, under the patronage of His Excellency, Sir Arthur Foulkes. The evening was a huge success and the ecstatic crowd were treated to a fabulous junkanoo and straw exhibition. Junkanoo exhibitors included Quentin 'Barabbas' Woodside's 'Junkanoo World' and Arlene and Silbert Ferguson's 'Educulture', souvenirs by Charles Outten and Philip Darville, a variety of junkanoo art works in all media, along with a fabulous straw display from world renowned Harl Taylor BAG designed by award winning fashion designer David Rolle assisted by Ray Anna Smith, and other original, authentic Bahamian straw products by Keesha Miller and The Plait Lady. Entertainment was provided by Barabbas' Youth Band which demonstrated their musical talents with rake n' scrape, steel pan and junkanoo music as well as their marching band prowess. Creative Nassau partners, the Lignum Vitae Centre of Hope and 'Movement for Change' representatives, Valentino 'Scrooge' Brown and Ulrich Voges, were also on hand to talk about their projects. A grand time was had by all as demonstrated in the photographs below courtesy of CN member, Rosemary Hanna, and Kim Smith. After receiving news of its successful application on December 1, Creative Nassau held a Press Conference at Doongalik Studios to celebrate this newsworthy event with its community partners: former Governor General, Sir Arthur Foulkes, Sandra Knowles of the Cable Bahamas Cares Foundation, Kevin Turnquest of 'Bahamas Then and Now,' Ed Fields of the Downtown Nassau Partnership, and Dr Leon Higgs of The Bahamas National Commission for UNESCO.